Looking back at images from the past is interesting. This is a picture of me taken in the summer of 1969. Jilda's family had gone to the beach for the week and I was working at night while going to college. I sort of invited myself to go at the same time. I headed out Friday afternoon with my cousin Tommy. I had a 1965 Impala SS at the time. It was fire engine red with an engine so powerful, it rattled the windows of nearby houses. We got a room at a hotel down the beach from where Jilda's family was staying. 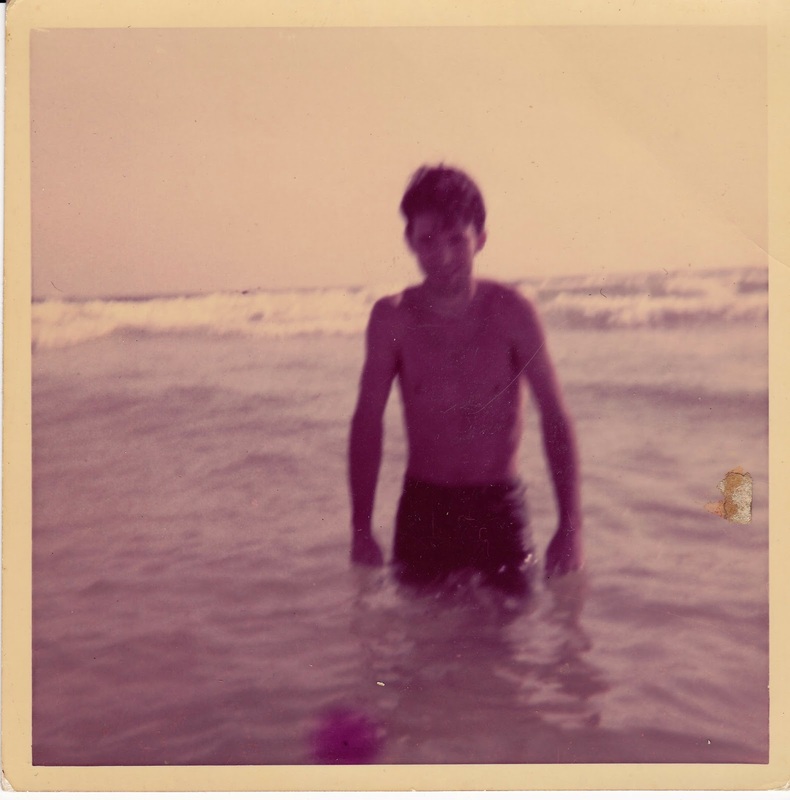 I was as thin as a refugee when Jilda snapped this photo with her Brownie Instamatic. The color is washed out in this picture, but the gulf water was green as liquid jade. Even now as I close my eyes, I can smell the salty surf and hear seagulls squawking as they patrolled the sand seeking crabs and small fish on the shore. It was before I understood the importance of sunscreen so hours after this picture was taken, I was red as firebrick. My cousin Tommy called me lobster-boy for the rest of the summer. During the early years of our marriage we spent most every vacation at the beach because it was some place we could go that didn't cost an arm and a leg. These days we only go once or twice a year. We plan to go for my birthday in a few months and I'm looking forward to time on the water. Yes you can fall in love at and with a beach. My future wife and I spent a lot of time at the beach while dating. When you return to the beach on your birthday, this time wear sunscreen. It's been years since I've been on the gulf...I'm wishing I was there now! Fun pic! You look a little cold lol Nice to be young. Looking back at places you loved is always good for the spirit. I miss our beach condo--I always feel better when I'm next to a large body of water!! Sounds like fine memories. Enjoy your birthday beach time. Have a wonderful time at the beach!! And...regarding that SS. Wow! Hubby would LOVE to have that car now. Those muscle cars were the bomb then....and even more so now. Have fun, Rick and Jilda. The beach is always a good idea...so relaxing!